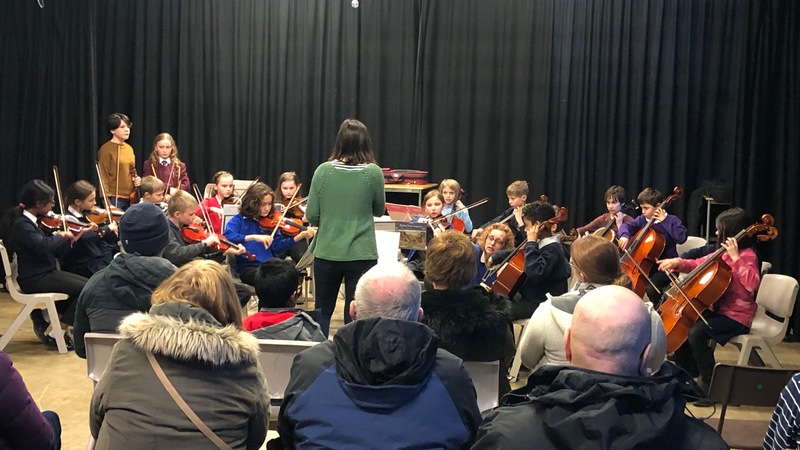 The Dark Peak Music Foundation Junior Strings group and those Intermediate players who haven’t been involved in the Buxton project gave an informal performance on Monday 19 March at 5:45pm in the Drama Studio at Glossopdale Community College. An enthusiastic and excited group of parents and siblings came to the concert to see and hear the young performers. First the intermediates played a Minuet & Trio by Mozart. This was followed by the exciting Shark Attack by Cathy & David Blackwell performed by the Juniors with great gusto. The mini-concert ended with John Ryan’s Polka a traditional tune arranged by Katherine and Hugh Colledge, played rousingly by the Intermediates and Junior Strings together. The concert was organised by Helen Parkes and Isobel Wren, under the leadership of Strings Director Emma Dixon. The Mini-Concert is part of our Adventure Program, where we encourage players to give performances from an early point in their development.